It’s hard enough to identify fossilized microbes on Earth. How would we ever recognize them on Mars? On August 7, 1996, reporters, photographers and television camera operators surged into NASA headquarters in Washington, D.C. The crowd focused not on the row of seated scientists in NASA’s auditorium but on a small, clear plastic box on the table in front of them. Inside the box was a velvet pillow, and nestled on it like a crown jewel was a rock—from Mars. The scientists announced that they’d found signs of life inside the meteorite. NASA administrator Daniel Goldin gleefully said it was an “unbelievable” day. He was more accurate than he knew. The rock, the researchers explained, had formed 4.5 billion years ago on Mars, where it remained until 16 million years ago, when it was launched into space, probably by the impact of an asteroid. The rock wandered the inner solar system until 13,000 years ago, when it fell to Antarctica. It sat on the ice near AllanHills until 1984, when snowmobiling geologists scooped it up. Despite Schopf’s note of skepticism, the NASA announcement was trumpeted worldwide. “Mars lived, rock shows Meteorite holds evidence of life on another world,” said the New York Times. “Fossil from the red planet may prove that we are not alone,” declared The Independent of London. Over the past nine years, scientists have taken Sagan’s words very much to heart. They’ve scrutinized the Martian meteorite (which is now on view at the Smithsonian’s National Museum of Natural History), and today few believe that it harbored Martian microbes. The controversy has prompted scientists to ask how they can know whether some blob, crystal or chemical oddity is a sign of life—even on Earth. Adebate has flared up over some of the oldest evidence for life on Earth, including the fossils that Schopf proudly displayed in 1996. Major questions are at stake in this debate, including how life first evolved on Earth. Some scientists propose that for the first few hundred million years that life existed, it bore little resemblance to life as we know it today. NASA researchers are taking lessons from the debate about life on Earth to Mars. If all goes as planned, a new generation of rovers will arrive on Mars within the next decade. These missions will incorporate cutting-edge biotechnology designed to detect individual molecules made by Martian organisms, either living or long dead. The search for life on Mars has become more urgent thanks in part to probes by the two rovers now roaming Mars’ surface and another spaceship that is orbiting the planet. In recent months, they’ve made a series of astonishing discoveries that, once again, tempt scientists to believe that Mars harbors life—or did so in the past. At a February conference in the Netherlands, an audience of Mars experts was surveyed about Martian life. Some 75 percent of the scientists said they thought life once existed there, and of them, 25 percent think that Mars harbors life today. The search for the fossil remains of primitive single- celled organisms like bacteria took off in 1953, when Stanley Tyler, an economic geologist at the University of Wisconsin, puzzled over some 2.1 billion-year-old rocks he’d gathered in Ontario, Canada. His glassy black rocks known as cherts were loaded with strange, microscopic filaments and hollow balls. Working with Harvard paleobotonist Elso Barghoorn, Tyler proposed that the shapes were actually fossils, left behind by ancient life-forms such as algae. Before Tyler and Barghoorn’s work, few fossils had been found that predated the Cambrian Period, which began about 540 million years ago. Now the two scientists were positing that life was present much earlier in the 4.55 billion-year history of our planet. How much further back it went remained for later scientists to discover. In the next decades, paleontologists in Africa found 3 billion- year-old fossil traces of microscopic bacteria that had lived in massive marine reefs. Bacteria can also form what are called biofilms, colonies that grow in thin layers over surfaces such as rocks and the ocean floor, and scientists have found solid evidence for biofilms dating back 3.2 billion years. Since then, scientists have developed other methods for detecting signs of early life on Earth. One involves measuring different isotopes, or atomic forms, of carbon; the ratio of the isotopes indicates that the carbon was once part of a living thing. In 1996, a team of researchers reported that they had found life’s signature in rocks from Greenland dating back 3.83 billion years. A quick start to life on Earth could mean that life could also emerge quickly on other worlds—either Earth-like planets circling other stars, or perhaps even other planets or moons in our own solar system. Of these, Mars has long looked the most promising. The surface of Mars today doesn’t seem like the sort of place hospitable to life. It is dry and cold, plunging down as far as -220 degrees Fahrenheit. Its thin atmosphere cannot block ultraviolet radiation from space, which would devastate any known living thing on the surface of the planet. But Mars, which is as old as Earth, might have been more hospitable in the past. The gullies and dry lake beds that mark the planet indicate that water once flowed there. There’s also reason to believe, astronomers say, that Mars’ early atmosphere was rich enough in heat-trapping carbon dioxide to create a greenhouse effect, warming the surface. In other words, early Mars was a lot like early Earth. If Mars had been warm and wet for millions or even billions of years, life might have had enough time to emerge. When conditions on the surface of Mars turned nasty, life may have become extinct there. But fossils may have been left behind. It’s even possible that life could have survived on Mars below the surface, judging from some microbes on Earth that thrive miles underground. When Nasa’s Mckay presented his pictures of Martian fossils to the press that day in 1996, one of the millions of people who saw them on television was a young British environmental microbiologist named Andrew Steele. He had just earned a PhD at the University of Portsmouth, where he was studying bacterial biofilms that can absorb radioactivity from contaminated steel in nuclear facilities. An expert at microscopic images of microbes, Steele got McKay’s telephone number from directory assistance and called him. “I can get you a better picture than that,” he said, and convinced McKay to send him pieces of the meteorite. Steele’s analyses were so good that soon he was working for NASA. Ironically, though, his work undercut NASA’s evidence: Steele discovered that Earthly bacteria had contaminated the Mars meteorite. Biofilms had formed and spread through cracks into its interior. Steele’s results didn’t disprove the Martian fossils outright—it’s possible that the meteorite contains both Martian fossils and Antarctic contaminants— but, he says, “The problem is, how do you tell the difference?” At the same time, other scientists pointed out that nonliving processes on Mars also could have created the globules and magnetite clumps that NASA scientists had held up as fossil evidence. But McKay stands by the hypothesis that his microfossils are from Mars, saying it is “consistent as a package with a possible biological origin.” Any alternative explanation must account for all of the evidence, he says, not just one piece at a time. The controversy has raised a profound question in the minds of many scientists: What does it take to prove the presence of life billions of years ago? in 2000, oxford paleontologistMartin Brasier borrowed the original Warrawoona fossils from the NaturalHistoryMuseum in London, and he and Steele and their colleagues have studied the chemistry and structure of the rocks. In 2002, they concluded that it was impossible to say whether the fossils were real, essentially subjecting Schopf’s work to the same skepticism that Schopf had expressed about the fossils from Mars. “The irony was not lost on me,” says Steele. Such debates may seem indecorous, but most scientists are happy to see them unfold. “What this will do is get a lot of people to roll up their sleeves and look for more stuff,” says MIT geologist John Grotzinger. To be sure, the debates are about subtleties in the fossil record, not about the existence of microbes long, long ago. Even a skeptic like Steele remains fairly confident that microbial biofilms lived 3.2 billion years ago. “You can’t miss them,” Steele says of their distinctive weblike filaments visible under a microscope. And not even critics have challenged the latest from Minik Rosing, of the University of Copenhagen’s Geological Museum, who has found the carbon isotope life signature in a sample of 3.7 billion-year-old rock from Greenland—the oldest undisputed evidence of life on Earth. At stake in these debates is not just the timing of life’s early evolution, but the path it took. This past September, for example, Michael Tice and Donald Lowe of StanfordUniversity reported on 3.416 billion-year-old mats of microbes preserved in rocks from South Africa. The microbes, they say, carried out photosynthesis but didn’t produce oxygen in the process. A small number of bacterial species today do the same—anoxygenic photosynthesis it’s called—and Tice and Lowe suggest that such microbes, rather than the conventionally photosynthetic ones studied by Schopf and others, flourished during the early evolution of life. Figuring out life’s early chapters will tell scientists not only a great deal about the history of our planet. It will also guide their search for signs of life elsewhere in the universe—starting with Mars. In January 2004, the NASA rovers Spirit and Opportunity began rolling across the Martian landscape. Within a few weeks, Opportunity had found the best evidence yet that water once flowed on the planet’s surface. The chemistry of rock it sampled from a plain called Meridiani Planum indicated that it had formed billions of years ago in a shallow, long-vanished sea. One of the most important results of the rover mission, says Grotzinger, a member of the rover science team, was the robot’s observation that rocks on Meridiani Planum don’t seem to have been crushed or cooked to the degree that Earth rocks of the same age have been— their crystal structure and layering remain intact. A paleontologist couldn’t ask for a better place to preserve a fossil for billions of years. The past year has brought a flurry of tantalizing reports. An orbiting probe and ground-based telescopes detected methane in the atmosphere of Mars. On Earth, microbes produce copious amounts of methane, although it can also be produced by volcanic activity or chemical reactions in the planet’s crust. In February, reports raced through the media about a NASA study allegedly concluding that the Martian methane might have been produced by underground microbes. NASA headquarters quickly swooped in—perhaps worried about a repeat of the media frenzy surrounding the Martian meteorite—and declared that it had no direct data supporting claims for life on Mars. But just a few days later, European scientists announced that they had detected formaldehyde in the Martian atmosphere, another compound that, on Earth, is produced by living things. Shortly thereafter, researchers at the European Space Agency released images of the Elysium Plains, a region along Mars’ equator. The texture of the landscape, they argued, shows that the area was a frozen ocean just a few million years ago—not long, in geological time. Afrozen sea may still be there today, buried under a layer of volcanic dust. While water has yet to be found on Mars’ surface, some researchers studying Martian gullies say that the features may have been produced by underground aquifers, suggesting that water, and the life-forms that require water, might be hidden below the surface. Andrew Steele is one of the scientists designing the next generation of equipment to probe for life on Mars. One tool he plans to export to Mars is called a microarray, a glass slide onto which different antibodies are attached. Each antibody recognizes and latches onto a specific molecule, and each dot of a particular antibody has been rigged to glow when it finds its molecular partner. Steele has preliminary evidence that the microarray can recognize fossil hopanes, molecules found in the cell walls of bacteria, in the remains of a 25 million- year-old biofilm. This past September, Steele and his colleagues traveled to the rugged Arctic island of Svalbard, where they tested the tool in the area’s extreme environment as a prelude to deploying it on Mars. As armed Norwegian guards kept a lookout for polar bears, the scientists spent hours sitting on chilly rocks, analyzing fragments of stone. The trip was a success: the microarray antibodies detected proteins made by hardy bacteria in the rock samples, and the scientists avoided becoming food for the bears. Steele is also working on a device called MASSE (Modular Assays for Solar System Exploration), which is tentatively slated to fly on a 2011 European Space Agency expedition to Mars. He envisions the rover crushing rocks into powder, which can be placed into MASSE, which will analyze the molecules with a microarray, searching for biological molecules. Sooner, in 2009, NASA will launch the Mars Science Laboratory Rover. It’s designed to inspect the surface of rocks for peculiar textures left by biofilms. The Mars lab may also look for amino acids, the building blocks of proteins, or other organic compounds. Finding such compounds wouldn’t prove the existence of life on Mars, but it would bolster the case for it and spur NASA scientists to look more closely. Difficult as the Mars analyses will be, they’re made even more complex by the threat of contamination. Mars has been visited by nine spacecraft, from Mars 2, a Soviet probe that crashed into the planet in 1971, to NASA’s Opportunity and Spirit. Any one of them might have carried hitchhiking Earth microbes. “It might be that they crash-landed and liked it there, and then the wind could blow them all over the place,” says Jan Toporski, a geologist at the University of Kiel, in Germany. And the same interplanetary game of bumper cars that hurtled a piece of Mars to Earth might have showered pieces of Earth on Mars. If one of those terrestrial rocks was contaminated with microbes, the organisms might have survived on Mars—for a time, at least—and left traces in the geology there. 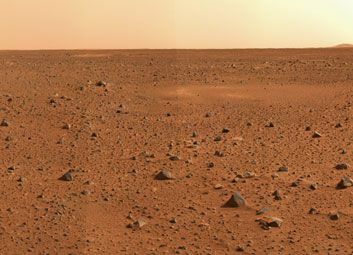 Still, scientists are confident they can develop tools to distinguish between imported Earth microbes and Martian ones. Finding signs of life on Mars is by no means the only goal. “If you find a habitable environment and don’t find it inhabited, then that tells you something,” says Steele. “If there is no life, then why is there no life? The answer leads to more questions.” The first would be what makes life-abounding Earth so special. In the end, the effort being poured into detecting primitive life on Mars may prove its greatest worth right here at home.